Four years ago, Apologetics Press released what was destined to be a classic book—one that would affect literally thousands of people and have a monumental impact on youth. With some 20,000 copies now scattered across the world, we are delighted to announce the release of a new, revised version of Dinosaurs Unleashed. This incredible volume refutes what is surely one of the most influential contentions of evolutionists, as they exploit dinosaurs to force-feed children false evolutionary propaganda. It provides proof positive that humans and dinosaurs once existed on Earth together. My wife, Claudia, took the kids to the Pell City (Alabama) public library last week. My son (age 6) wanted to get some books about dinosaurs because there is a T-Rex exhibit at the Anniston Museum of Natural History that he wants to go see. While they were looking for books, one of the librarians pulled out Dinosaurs Unleashed. She asked if we had seen it and she highly recommended it! Claudia told her that we were indeed familiar with the book and, in fact, we were the ones who had donated it to the library. Claudia looked, and the book has been checked out several times! I thought you would like to know how well received those books have been! They are not only being checked out, but the librarians are recommending them! Jeremy came home from school saying something about dinosaurs living millions of years ago. Well, yesterday at school, his teacher asked him to read aloud a section from their science book that said, “Dinosaurs are animals that lived millions of years ago.” After he read that, he said, “Mrs. Madison, I don’t think that’s right.” He said his teacher responded by saying, “Jeremy, I think you’re right.” He then said the rest of the kids in class joined in saying they thought Jeremy was right, too. That just goes to show you how kids can learn at a young age that their school books are not always right. Thanks SO much for your work in this field. I don’t believe we could have made the same kind of impact on Jeremy without your seminar and the WONDERFUL new book on dinosaurs. We continue to believe that this is one of the most fascinating books ever produced by creationists on the subject of dinosaurs. Indeed, we are confident that this book will continue to have a tremendous impact, not only on this generation, but also on future generations as young readers devour its fascinating contents. 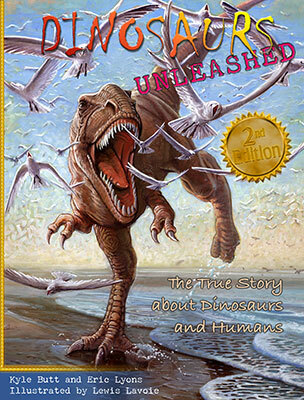 You may want to consider ordering a copy of Dinosaurs Unleashed—not just for your own children or grandchildren, but for neighborhood kids or friends and relatives as well.